Oh My Aging Hair ... - Anti-Age Naturally! Just like skin, hair ages too (aging hair, sigh). And I’m not just talking about it turning gray. The shine goes away, the texture changes and it no longer looks as youthful and healthy. And if that’s not enough … every decade after the age of 40 you lose 10% of your hair. Stress, hormones and health problems can make matters even worse. But I have good news … you can turn the clock back on your locks. There are many natural ways to regain the youth of your hair. Let’s start at the root of the problem. Don’t comb or brush your hair while it’s wet. Hair becomes more brittle as you age so you have to be more gentle. Don’t risk breaking your hair by being as rough as you used to be. If you use a lot of styling tools, like hair dryers or flat irons, give your hair a break one or two days per week, or as often as possible. For healthy hair and to prevent hair fall, especially in menopausal women, eating red meat, fish, pork or chicken (four times a week) will give your hair the protein, zinc and iron it needs1. Also make sure to include foods that are rich in Vitamin A, B and C, like eggs, oranges, strawberries, brussel sprouts, sweet potatoes, spinach, green, red and yellow peppers. For extra Vitamin A, Vitamin E, copper, biotin and collagen try Simply Beautiful. Just like dry skin you have to treat dry hair. Dry frizzy unhealthy hair can really add years to your looks. To tame the frizz, at least once a week, treat your hair to a mask. You can do double duty here and put one on your face too. Mix all ingredients together and apply at the root working your way to the ends. Leave on for at least 15 minutes, but longer if possible. Rinse well. For added shine do a last rinse with apple-cider vinegar. If you have thick or very long hair you may need to double the recipe. A great hairstyle can take years off your looks. Don’t get stuck in a decade (huge aging hair problem) and consult with a hairdresser. A hairdresser can help you decide what type of haircut is right for your face and your style. If you don’t know a good hairdresser, ask someone whose hair you love for a recommendation. For healthy hair growth you may need something that combats the hormone dihydrotestosterone (DHT) and androgenic alopecia. You see, DHT is testosterone that has been converted. In women, DHT should be very low. When your DHT is high it may cause hair loss. One formula that may block DHT is Revitalize. With the 100% money-back guarantee you have nothing to lose and lots of hair to gain. Click here to get your bottle today. If you eat healthy, treat your hair right and have tried many of the above treatments and still have dry, dull or falling hair, you may want to speak with your doctor. It could be a sign of a medical problem or the side effect from a medication. So here’s to younger hair days a head and say goodbye to aging hair. 1Goluch-Koniuszy ZS. 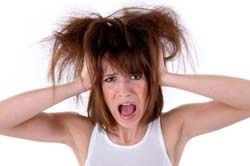 Nutrition of women with hair loss problem during the period of menopause. Prz Menopauzalny. March 2016. 2Panahi Y, Et. al. Rosemary oil vs minoxidil 2% for the treatment of androgenetic alopecia: a randomized comparative trial. Skinmed. February 2015.